Ferrography is one of the best predictive maintenance and analytical tools. This technique for wear particle analysis has become prominent in the paper industry, in the healthcare industry (particularly with artificial joints and limbs), and in industrial plants with automated operations. Bichromatic ferrography is the analysis of particles present in fluids to indicate mechanical wear. It enables plant managers, maintenance managers, and healthcare professionals to make critical decisions more effectively. The ferrogram is a specially designed and prepared microscope slide that is examined under a polarized bichromatic microscope equipped with a camera. Red, green, and polarizing filters are used to distinguish the size, shape, composition and surface conditions of ferrous, nonferrous and non-metallic particles. With bichromatic illumination, metal particles (which reflect light) appear bright red, whereas nonmetallic particles appear green because light transmits through them. These particles are further studied and classified in order to determine the type of wear and the source of the particle. 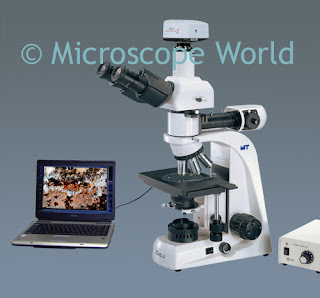 View a complete bichromatic ferrography microscope system here.